We bring you last week's top performances from Bahamians who are playing abroad and who all have had prior experience of national team duties at youth or senior level. #1. This week's number one is an international forward Kentwan Smith (203-91, college: Stetson, currently plays in Denmark). He could not help Naestved (14-10) in their last game on Monday. Despite Smith's very good performance the third-placed Naestved (14-10) was defeated 93-81 at home by the lower-ranked Horsens IC (#7) in the ProA group. He recorded a double-double by scoring 20 points and getting 10 rebounds. It's Smith's first season with the team. This year Smith averages: 9.8ppg, 4.9rpg, 1.2apg, 2FGP: 62.5%(80-128), 3FGP: 45.7%(32-70) and FT: 69.8%. He is currently a member of the Bahamas senior national team. #2. Second place goes to an international forward David Nesbitt (200-91, college: St.Thomas, FL, currently plays in Brazil). Nesbitt contributed to an easy victory against the sixth-ranked Corinthians (12-14) crushing them 91-65 in the Brazilian NBB on Saturday night. He scored 7 points in 18 minutes. Clube de Regatas do Flamengo (22-4) is placed first in the NBB. It was his team's 11th consecutive victory in a row. This year Nesbitt's overall stats are: 8.0ppg, 4.5rpg, 2FGP: 56.0%(56-100), 3FGP: 36.5% and FT: 81.1% in 28 games he played so far. He is in the roster of the Bahamas senior national team. #3. The Bahamas player who performed third best last week abroad was an international power forward Kadeem Coleby (206-89, college: Wichita St., currently plays in Japan). He was the major contributor in an Akita Happinets' victory against the sixth-ranked Levanga Hokkaido Sapporo (10-50) crushing them 73-44 in the Japanese B League in Sunday night's game. Coleby recorded 14 points, 6 rebounds and 3 blocks. Akita Northern Happinets (17-43) are placed fifth in East group. The Regular Season already ended. Coleby has relatively good stats this season: 12.8ppg, 8.4rpg, 1.4apg, 2.3bpg, 1.1spg, 2FGP: 54.0% and FT: 57.4%. Worth to mention Coleby played also at Eurobasket Summer League, which helped him get the job in pro basketball. He is also a member of the Bahamas senior national team. #4. An experienced center Gjio Bain (211-85, college: S.Mississippi, currently plays in Japan) was not able to help Kagoshima (1-7) in their last game. Despite Bain's very good performance the bottom-ranked Kagoshima was crushed 100-79 on their home court in Renova by the second-ranked Koshigaya Alphas. He was the top scorer with 18 points. Bain also added 9 rebounds in 35 minutes. It was Kagoshima's sixth consecutive loss in a row. There are only four games left until the end of the Second Stage. So now every game will be critical. This year Bain has relatively solid stats: 13.5ppg, 9.8rpg and 1.1bpg in 16 games. He used to play for the Bahamas national team back in 2011. #5. International center Shaquille Cleare (203-93, college: Texas, currently plays in Spain) was not able to secure a victory for Lleida Basquet (16-16) in their game against Leyma Basquet (12-20) in the Spanish LEB Gold (second division). Cleare scored 8 points. Lleida Basquet was edged 90-88 on the road by the lower-ranked Leyma Basquet (#13). They ended the series of three consecutive victories. There are only two games left until the end of the Regular Season. So now every game is very crucial. Cleare has reliable stats this season: 11.3ppg, 5.9rpg and 1.3apg. He plays currently for the Bahamas national team. #6. Center Zane Knowles (208-92, agency: Octagon Europe, college: Texas A&M-CC, currently plays in France) couldn't help C'Chartres (13-9) in their last game. Despite Knowles' good performance C'Chartres lost 82-92 in Rouen to the lower-ranked (#5) SPO Rouen. He had a double-double by scoring 12 points and getting 10 rebounds in a mere 19 minutes. It was C'Chartres' first loss after three consecutive victories. Knowles' stats this year are: 10.9ppg and 6.7rpg in 13 games. 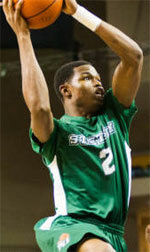 He is an international player who is currently on the senior Bahamas National Team roster. #7. International forward Jonathan Augustin-Fairell (201-93, agency: Duran International, college: Murray St., currently plays in France) managed to help Denain ASC Voltaire to win against the seventh-ranked Gries/Oberhoffen (15-12) 77-70 in the French ProB (second division) last Friday. Augustin-Fairell scored only 3 points. Denain ASC Voltaire (9-18) is placed 15th in the ProB. Augustin-Fairell's total stats this season are: 7.8ppg and 3.8rpg. He has a dual citizenship: Bahamas and American. Augustin-Fairell is also Bahamas national team player. #8. Swingman J.R. Cadot (196-87, college: TCU, currently plays in Spain) contributed to an easy victory against the eighth-ranked Plasencia (13-18) 59-42 in the Spanish LEB Silver (third division) on Sunday night. He recorded 9 points, 10 rebounds and 2 blocks in 20 minutes. Aceitunas Fragata Moron (16-16) is placed seventh in East group. There are only three games left until the end of the Regular Season. So now every game will be important. This year Cadot's total stats are: 4.3ppg and 4.0rpg in 12 games. He plays currently for the Bahamas national team. #9. International forward Dwight Coleby (206-94, college: WKU, currently plays in Belgium) couldn't help one of league's weakest teams Liege Basket (14-8) in their game against Basic-Fit Brussels (18-10) in the Belgian Euromillions League. Coleby scored 5 points. Liege Basket was badly defeated 93-76 in Brussels by the higher-ranked Basic-Fit (#4). Coleby averaged so far 13.9ppg and 8.7rpg. He is also in the roster of the Bahamas national team. #10. Forward Tavario Miller (203-94, college: Texas A&M, currently plays in Spain) contributed to an easy victory against the 12th-ranked La Roda (9-22) crushing them 80-56 in the Spanish LEB Silver (third division) last Sunday. He recorded 5 points and grabbed 6 rebounds in 27 minutes. Grupo Eleyco Baskonia (20-6) is placed third in West group. It was his team's sixth consecutive victory in a row. There are only three games left until the end of the Regular Season. So now every game will be extremely important. Miller averaged so far 11.4ppg, 8.4rpg, 1.1apg and 1.1spg in 30 games. Miller attended previously one of camps at Eurobasket Summer League on his way to pro basketball. He is an international player who is currently on the senior Bahamas National Team roster. #1. Klay Thompson (201-G-90, college: WSU, currently plays in NBA) was the major contributor in a Golden State Warriors' victory against the Los Angeles Clippers (48-34) 113-105 in the NBA in Sunday night's game. He recorded 32 points (!!!) in 40 minutes. The Golden State Warriors have a solid 57-25 record this season. It was his team's sixth consecutive victory in a row. It's Thompson's eighth year with the team. Thompson has individually a very good season with high stats. He averages: 21.4ppg, 3.8rpg and 2.3apg in 82 games he played so far. Thompson has a dual citizenship: Bahamas and American. 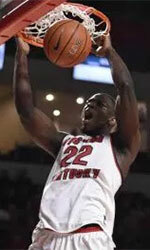 betFIRST Liege Basket (Euromillions League) landed 25-year old Bahamas international forward Dwight Coleby (206-109kg-94, college: WKU). He started the season at Akita Northern Happinets in Japanese B League. In 12 games he averaged 14.8ppg, 10.5rpg, 1.7apg and 1.1bpg this season. Coleby played in the final of C-USA Tournament in 2018. He has been also a member of Bahamas international program for some years. Coleby has regularly played for Bahamas senior team since 2014 and previously for U17 National Team back in 2011. He represented Bahamas at the CBC Championships in Tortola (Virgin Islands) five years ago. Coleby's team won Gold and his stats at that event were 4 games: 3.3ppg, 2.8rpg. Coleby graduated from Western Kentucky University in 2018 and it is his first season in pro basketball.